By their name and album title, I'll give you two guesses what kind of metal this is, and the first guess doesn't count. Yeah, Daemonicus practices death metal, but not in its modern form. Daemonicus is pure old school, circa 1990, traditional Swedish death metal. It seems there's a renaissance within Sweden for their early history (as if this country or the region needs another death metal band). Fortunately, on Host of Rotting Flesh, Daemonicus honors their early forbears by pulling off this style with acumen. But that's were the accolades could end as album is seriously ordinary. Though Host of Rotting Flesh may be devoid of the usual blast beats and breakdowns so prevalent in modern metal, it doesn't venture very far from its early Swedish roots. The typical death metal is characterized by growling death vocals, an abundance of steady riffing, little developed guitar solos, and enough time changes to keep it mildly interesting. Additionally, the usual lyrical topics are covered including death, dying, more death, and the inane and superfluous attacks on Christianity. (Note the upside down crucifix on the cover; now there's something novel). Daemonicus can vary between the faster side of thrash (Funeral for the Living) and the slower side of doom (Unrest in Peace); mostly, however, its a clever mix within each song. To their credit, some songs including Carnage, Welcome the Dead, and Swarm of Death are a bit more melodic and so, more atypical and enjoyable. However, once you get about half way (or maybe sooner), you've heard it all and have no need of venturing any farther. Actually, Host of Rotting Flesh is so average and adequate that, without some concentration on your part, it could easily pass for death metal elevator music. If you lost your concentration or interest at anytime during its play, then you'd probably miss the entire album and worse, not even notice. Overall, Daemonicus' Host of Rotting Flesh is solid death metal in the early Swedish tradition played very well. However, it's also so typical and unadventurous to be ordinary. Yet, fans of the old school will eat this up like a Romero zombie savoring rotting flesh in the Pittsburgh countryside. 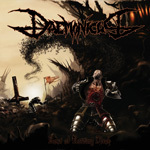 Daemonicus' Host of Rotting Flesh is solid death metal in the early Swedish tradition played very well. However, it's also so typical and unadventurous to be ordinary. Yet, fans of the old school will eat this up like a Romero zombie savoring rotting flesh in the Pittsburgh countryside.